Advertise on the Doric Phrases website and social media pages to reach out to thousands of readers throughout Aberdeenshire and the City. Packages start from just £50. Our low-cost advertising packages start from just £50 which gives you one social media post on Facebook (4523 followers) and Twitter (5953 followers). For an additional £50 your advert can appear on each of our web pages for one week. For an additional £100 your advert can also appear on all pages of my other website aboutaberdeen.com and one post on its social media pages. Simply e-mail doricphrases@outlook.com for further information. Payments will go towards the hosting costs of running the website and research into the Doric words and phrases database, so thank you for contributing. Please note that payment in advance via Paypal is required prior to placements of ads. 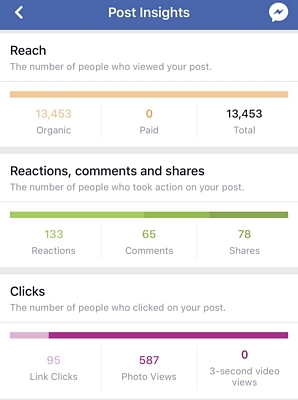 13,453 organic reach with 133 reactions, 65 comments and 78 shares. "Shortly after Chris posted on his Doric Phrases Facebook page, I had a flurry of sales on my Etsy shop. If you are looking to reach out to local audience in Aberdeen and Aberdeenshire, and those with an interest in Doric, it is well worth contacting Chris to find out what he can offer." Karen Barrett Bramble Graphics.